This is a story that I wrote for a school assignment that was to "Christianize" a Greek myth. The myth that I chose was "Pandora's Box." So, without further ado, here is my version! The only response the king’s faithful servant received was a saddened smile. Understanding His master’s thoughtful change of mood, the servant left. God cast his gaze over His chosen people. They’d better be careful what they wish for . . . The king’s faithful servant journeyed down the mountainside to the village below. The racket of chatter and bustle was audible from a mile off. Once entering the village, he walked down the main lane in the village’s center. He surveyed the houses and their many inhabitants. Women were gathering herbs in a basket, men were fixing a roof, young women were planting seeds, and children were running pell-mell through the street. Then his gaze was cast over the grandest house in the village, sturdy Epimetheus and curious Pandora’s house. He grimaced as his thoughts raced back to the box, for they were the safe-guarders of that precious gift. Epimetheus was standing in the doorway when he saw the king’s faithful servant pass by. He studied the faithful servant’s movements as he passed the doorway and then sighed as he pondered his own life. 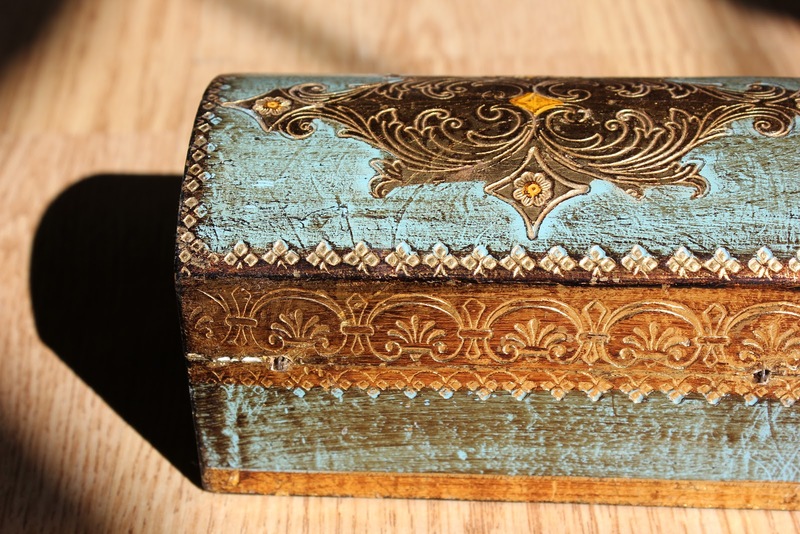 His thoughts drifted from his wealth, to his work, to his wife - a very gift from the king himself – to the box inside. Whatever am I going to do with that! It won’t be long till the villagers come here insisting it be opened. Their idea that happiness is to be had in things the king has hidden from us sounds so true; however, do we villagers really know what true good is for ourselves to such a precise degree that we will directly disobey the king’s orders? Ever pondering, Epimetheus decided to take a walk through the village and get a closer perspective of the villagers to gauge their shifting feelings. Pandora stretched her muscles and leaned back in her chair after she watched Epimetheus walk out the door. What a perfectly dreary day, no one to talk to and nothing to do. Dejectedly, she got up from her chair and walked to another room. She surveyed its contents. A basket full of yarn for her weaving, a chair big enough for two, a crumpled blanket, and a messy pile of clothes were all visible. Still unsatisfied, she was about to leave when she noticed a dusty edge of something half hidden in a corner. Curiously, she walked over to it and blew the dust off, uncovering a box. I’m afraid it’s rather an ugly, small box. She sighed. Again, here is yet another thing with absolutely no interesting qualities. Ahh well . . . Pandora suddenly stood upright as she remembered the giver of this box, the king. This box was a gift with specific instructions, instructions not to open it under any circumstances. Any circumstances, meaning none whatsoever? Pandora set the box down and went to sit in the chair. Her mind filled with thoughts of it, the box. The gifted and entrusted box. The mysterious box. The box with seemingly no purpose, but at the same time, the box with instructions. Yet what a small and harmless box it was, sitting all alone, forgotten in a dusty corner. The box should have a purpose, a duty in life. Surely, by its weight, it wasn’t empty! It must be filled to the brim with wonderfully new and good things bringing new dimensions of happiness and telling of its divine purpose, for it was from God. And that king does want everything to be used for its grand purpose, nothing at all should be left idle and be wasted. The box must be opened. Pandora returned to the box and inspected it even more carefully than before. Just a crack is all I need. Then, its purpose will be revealed, and I will do good by assigning it a duty. Furthermore, think of the happiness I will unlock! Pandora placed her hand on top of the lid and felt for the latch. She curled her fingers around it and moved her arm upward. The lid opened a crack, and she pulled it open the rest of the way. Instantly, Pandora felt a chilling, lifeless gust of air blow onto her face. She screamed as she heard a hissing noise. A whirlwind quickly surrounded her, and she felt within that what encircled her was not good, pure, and lovely. It was something she had never known before. It was evil. Pain, worry, envy, jealousy, greed, pride, hate, fear, selfishness, impatience, depression, restlessness, cruelty, wickedness, betrayal, and many other sensations unfelt before welled inside Pandora. She staggered and collapsed upon the floor. She gasped for breath and almost fainted. With newly-found panic, she tried to gather her thoughts from among this surplus of sensations. What have I done? The whirlwind was leaving her and floating to a window. It hissed and passed through the window into the street. Then, it split apart into many segments and each new segment slid through the streets and entered the houses. Cries of anguish were heard in its wake. Pandora tried to swallow and tried to move but found that she could not. Then, she heard a fluttering. A glowing, pink creature emerged from the very bottom of the box. It was a butterfly. It was not noticeable before because its beauty was smothered by the evil on top. It came and landed on Pandora’s shoulder. A gushing wave of relief from the previous sensations flooded over Pandora as soon as the butterfly landed. Tears gushed in her eyes and inexpressible thankfulness was in her heart. Inscribed on the butterfly’s left wing, barely visible, she noticed a word: Hope. The butterfly flew to the window and started its journey throughout the village. Epimetheus’ body contorted with the impact of the whirlwind. His mind staggered with the new sensations’ force. Then, suddenly, Epimetheus was relieved. He lifted his head in bewilderment, wondering who had relieved him, but the only thing he saw was a bright butterfly gliding away. Epimetheus thought nothing of the butterfly because only one thought could penetrate his shock. The box. He knew that it had been opened. Wisdom told him that these sensations were the result of disobedience to the king. How foolishly I have been thinking. Who should ever dare to rebel against the Almighty King? He is the only one who truly knows our best. Yet, wasn’t the King the one who gave only good gifts? What about the relief he felt? Pondering, he stood for a few moments. How can this fit into His plan? Determined anew, Epimetheus walked out of the village and started up the mountain. God exhaled. It is done. They have done it. If only they would have chosen to trust and walk down the path of obedience and not to entertain rebellious thoughts. If only they would have embraced my love and not searched for happiness elsewhere. If only they could know how much I still love them even now. Oh, that they might know the great, wonderful plans of redemption I have planned for them on this new path they must now walk down, hand in hand with me.